Two confounders, on first glance. First, these were lean young athletes. Those on LCHF lost a statistically significant amount of weight and about 3 times more than those on high carb. In lean young athletes without much fat to lose, it’s safe to assume some water &/or muscle loss. NEITHER of those bode well for physical performance. Imo, the researchers could’ve upped the calories in the LCHF group to keep body weight controlled, because the point of this particular study was PERFORMANCE not WEIGHT LOSS. 1- it’s kind of making a mountain out of a molehill: setting the baseline at 36 minutes makes the 190 second improvement look bigger than it really is given the large error bars. 2- keto did exactly as expected: performance plummeted then recovered back to baseline levels by week 3. Now that they’re ketoadapted, we can expect an intensified training program to improve performance just like it did in the high carb group. The researchers could’ve had ketoers ketoing for 3 weeks, THEN take baseline measurements, THEN take final measurements after 3 more weeks. 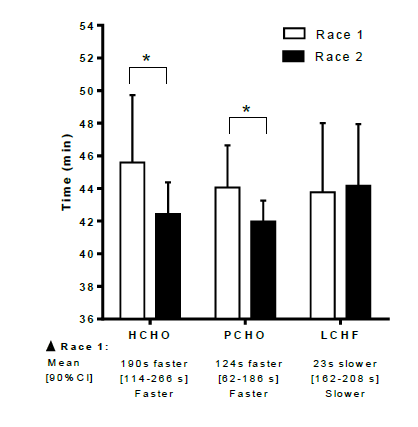 This would’ve more accurately assessed “the performance benefit of intensified training in elite race walkers” in keto vs. high carb, imo. Sound reasonable? This entry was posted in Advanced nutrition, diet, Dietary fat, Energy balance, Exercise, fat, insulin, Ketosis, muscle, Protein, strength, TPMC and tagged Atkins, calories, calories proper, carbs, diet, energy balance, energy expenditure, exercise, fat, insulin, ketogenic, ketosis, nutrition. Bookmark the permalink.